Read your prompt (the question) one more time. Often a prompt will ask you to answer more than one question, or address several points. Make sure you address or answer them all! Did you make your point? (Yes, that’s the same thing as your “main point.”) You should be able to state it in a sentence or two. And it should be stated somewhere in your essay as well. If you can’t do this, chances are your essay is too broad, and too broad means boring. Do you prove the (main) point you are making in your essay? Did you provide examples as “evidence”? When you give examples in your essay, or describe something, are you specific? Use details! Check for too many adverbs (usually ending in ly, such as “very” and “suddenly”). Take them out, and the sentence improves. “I was really upset about the news.” “I was upset about the news.” Also, watch for adjective overload. To check the flow and tone of your essay, read it out loud. If something sounds awkward, fix it. If you need to stop and take a breath because the sentence is so long, break it into two sentences. If a sentence or word sounds out of place, too abrupt, too folksy, too formal, adjust it to match the feel of your essay. Keep an ear out for the obnoxious Tuxedo Talk or if you come across as snobby or unlikable. For a final edit, print out your essay and proofread it on hard copy. Often, errors pop out better in print than on the computer. Double check your word count. You may have added words at some point and not realized you are over the limit. If there is a minimum, make sure you are over that as well. Triple check that you are sending it to the right college, especially if you are recycling essays. Pat yourself on the back for writing this essay. Writing about yourself is HARD! Even though you are probably sick of your essay by now, and can’t wait to send it off into cyberspace, it’s most likely better than you think! Good job. 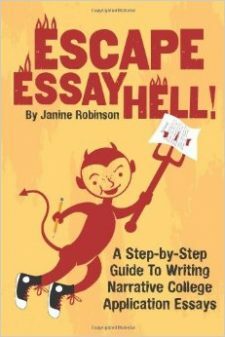 Read my Ultimate Checklist for more ways to make sure your essay is both compelling and memorable.